Weber makes amazing products – we’ve been absolutely impressed with our grill from them. Throughout the summer I included links to some of their grilling recipes in my Menu Plan Monday posts, and I became aware of the mouth-watering recipes they produce. 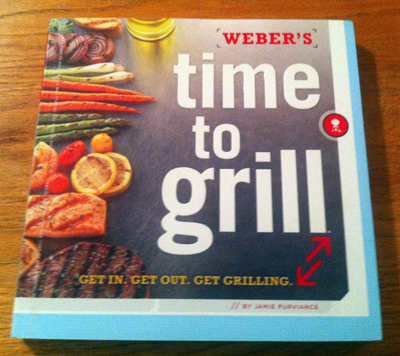 It was no surprise, then, when I heard Weber had produced a grilling cookbook, Time to Grill. And people, this is no ordinary cookbook. The recipes are creative, the photos are beautiful, and it’s organized SO well, making it easy to find the perfect recipe for your occasion. 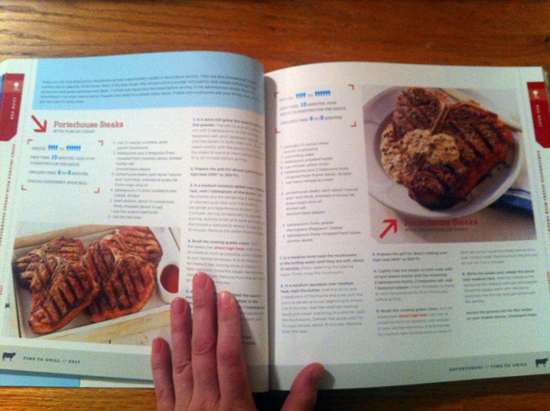 It’s hard to get a grasp on the size of this cookbook – to me it looked pretty small online – but it’s substantial at about 10″ square. It’s 304 pages, making this a solid book to give to any foodie or grilling fan. Take a look at the page layout. As a designer, I’m in love with the thoughtfulness of this book design. The colors are vivid, the photos are vibrant, and the formatting is pretty genius. There are color-coded tabs on the sides of the pages, letting you easily find the category you’re looking for (veggies, poultry, beef, etc). You’ll also see an icon at the bottom of the page – in this shot you can see the cow, letting you know you’re looking at beef recipes. The bracketed area under the recipe title on the left page lets you know how many people this recipe will serve, the prep time and the grilling time. You won’t only find recipes in this book, though. There are tips about tools you’ll need, stocking your pantry, how to save time when grilling, different knives (and how to sharpen them), how to dice an onion, and more. This is a beautiful, useful cookbook that would be great to purchase for someone on your list. Find out more about the book here, view sample recipes and find out about the free recipe toolbox app for the iPhone. That’s not all… one of you lucky readers will get this book for yourselves – or if you’re feeling generous, for someone on your holiday shopping list! This contest is open to all U.S. residents 18+. Entries will be accepted until the end of the day (midnight Central) Tuesday, November 22. By entering this giveaway you agree to the Official Rules. Mandatory Entry: Comment on this post telling me your favorite thing to grill – chicken, steak, veggies, or something more creative! Note: I received a copy of the cookbook for review. All opinions are honest and are my own. I was not compensated monetarily for this post. I love to grill chicken and veggies!